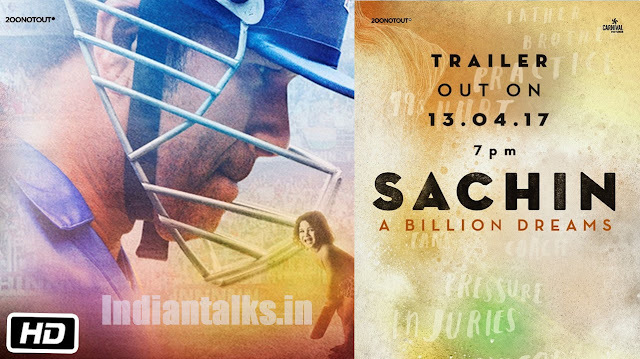 Sachin A Billion Dreams Trailer: The official trailer of the much-awaited biopic film of Master Blaster Sachin Tendulkar i.e “Sachin A Billion Dreams” will be Releases out on 13th April at 7 PM. This biopic marks the debut of Sachin as an actor. The film captures Tendulkar’s cricket and personal life in substantial detail, as well as reveals few aspects of his life which have never been heard of or seen before. The Sachin A Billion Dreams trailer shows billion or more fans that Sachin has come to gain over the years. It concentrates lightly on the struggles and more so, on the man himself. There is also a glimpse of former captain Mahendra Singh Dhoni talking about Sachin.